KombiEngines are available in four power versions. 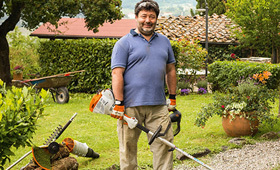 The basic, light KM 56 RC-E features STIHL ErgoStart (E) for simplified starting. The KM 90 R / 100 R / 130 R series use the revolutionary STIHL 4-MIX engine which combines the advantages of 2-stroke and 4-stroke engines, giving high torque, more power and low emissions ideal for when things get tougher.